-From Sancerre: 15 minutes; take the D7 in the direction of Sens-Beaujeu. When you arrive on the place of Sens-Beaujeu, follow the direction of Neuilly-en-Sancerre. In the third bend, take the alley which is on the right. -From Aubigny: 25 minutes; take the D7 in the direction of La Chapelotte then Sens-Beaujeu. When you arrive on the place of Sens-Beaujeu, follow the direction of Neuilly-en-Sancerre. In the third bend, take the alley which is on the right. 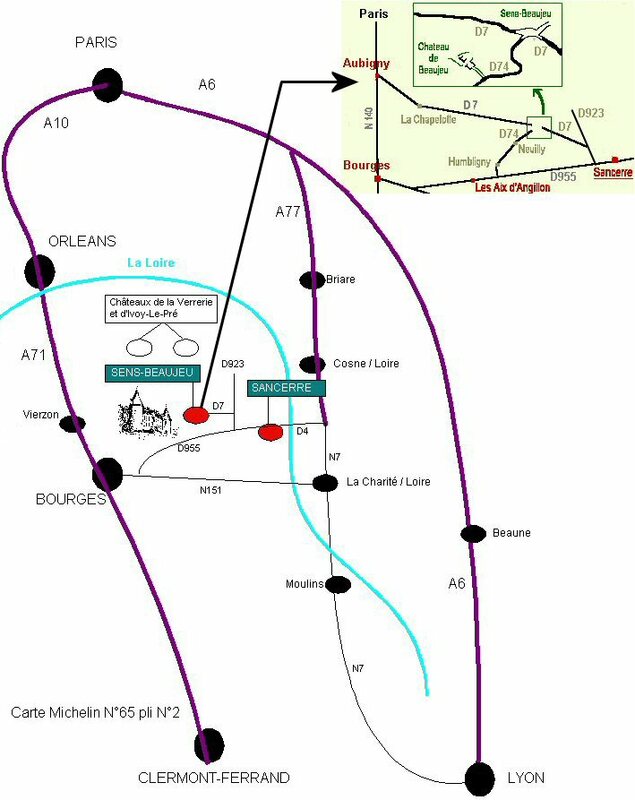 -From Bourges: 35 minutes; take the D955 in the direction of Sancerre, drive through Les Aix d'Angilon and Saint-Céole. Then take onthe left the direction of Humbligny. At Humbligny, drive to Neuilly-en-Sancerre and Sens-Beaujeu. The Château de Beaujeu is located in the valley of the Sauldre river, just before Sens-Beaujeu. To come back to the previous page, use the menu.